In the wake of a joyful wedding between Riker (Jonathan Frakes) and Troi (Marina Sirtis), Picard receives another reason to celebrate: the Romulans want peace and the captain will be the Federation's emissary. But as the Enterprise heads toward the Romulan Empire, a brilliant villain awaits-harboring a diabolical plan of destruction and an unimaginable secret that will give Picard his most fearsome challenge. Opening weekend $18.513 million on 2711 screens. Rated PG-13 for sci-fi action violence and peril and a scene of sexual content. So much for the legendary “odd/even” curse that allegedly dictated which Star Trek films would rule and which would drool. Since I don’t like the even-numbered Star Trek IV: The Voyage Home but I really like the odd-numbered Star Trek: Generations, I never subscribed to that theory anyway. The tenth entry in the Trek cinematic series, 2002’s Star Trek: Nemesis formally kills the “even/odd” trend for even those who resolutely depended it over the years. Maybe we need to begin a “divisible by five” theory, as Nemesis - which could also be called Star Trek X - joins 1989’s Star Trek V: The Final Frontier as the least successful entries in the franchise. Actually, with inflation, Frontier probably made as much or more than 1998’s Insurrection, but although many fans dislike the latter, the former remains the series’ most widely disparaged effort. We’ll need a few years of hindsight to determine if Nemesis ever endures such widespread disdain, but it will probably go down as the biggest financial dud of the series. With a gross of only $43 million, it came and went without leaving much of a wake. Did Nemesis deserve to flop? No, but it doesn’t offer one of the best Trek experiences. The film starts with a meeting of the Romulan Imperial Senate. They discuss a proposition from a dude named Shinzon to unify the planets Romulus and Remus. When the senate rejects the concept, Shinzon’s allies stage a violent coup. We later learn that Shinzon’s taken over as praetor. Before then, however, we cut to the long-awaited wedding of Enterprise First Officer Will Riker (Jonathan Frakes) and Counselor Deanna Troi (Marina Sirtis). They plan to finally leave the Enterprise, and Lt. Commander Data (Brent Spiner) will take his place as Number One at Captain Jean-Luc Picard’s side. Before this split occurs, however, the Enterprise picks up a positronic signature that seems to indicate the existence of an android on a planet called Kolarus III. Picard decides to investigate, so when they arrive, he takes Data and Lt. Commander Worf (Michael Dorn) down to the surface. There they find a disassembled robot named B-4 (Spiner again), a less sophisticated predecessor of Data’s. After they come under assault by unknown forces, the four barely escape, and they make it back to the Enterprise, where they try to learn more about B-4. “B-4” this gets too far, though, they get the command to take on a diplomatic mission to Romulus where they will meet the Reman Praetor Shinzon. When they arrive, they encounter a Reman warbird called the Scimitar and first meet Shinzon’s Viceroy (Ron Perlman) before they get to chat with the man himself (Tom Hardy). Shinzon speaks of his desire for peace and hints at an intimate connection between himself and Picard. I’ll halt my synopsis there, for I don’t want to ruin any potential surprises. Suffice it to say that the rest of Nemesis investigates these links and also gets into Shinzon’s motives and true desires. Like the best Trek, Nemesis enjoys an intellectual side absent from most flicks in the genre. Here the debate over nature vs. nurture comes to the forefront, and this occasionally adds some depth to the proceedings. However, “some” depth is about all we get, as the movie never really seems to invest much effort in those notions. Essentially, Nemesis pays lip service to the concepts but doesn’t dive into them with any substance; it remains largely superficial in that regard. That’s the main problem with Nemesis: it can’t quite invest much energy in any domain. It dabbles in some psychology, it tosses in the odd battle sequence, and it presents some relationship material. Unfortunately, it fails to explore any of these subjects in a rich manner. It keeps all of them at a distance to a large degree and doesn't manage to go much of anywhere. That doesn’t mean I regard Nemesis as a flop, for it offers some good moments. It embraces too many clichés; it goes into some “evil twin” bits, and the climax far too strongly echoes Star Trek II: The Wrath of Khan. However, it provides a couple of very good action sequences and maintains a reasonably fluid and engaging story. It also works better the second time, as I preferred it during my DVD viewing than I did when I watched it theatrically. 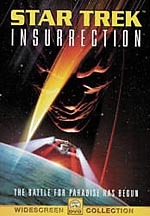 That’s the opposite of something like Insurrection, which shows more flaws with additional glimpses. Perhaps eventually I’ll really like Nemesis and think of it as a stronger film than I do currently. 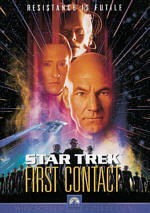 However, after two screenings, I regard it as firmly average Trek, and it remains something of a disappointment. The movie certainly had potential, and it occasionally lives up to those possibilities. Unfortunately, the overall presentation is fairly lackluster and not something that manages to stick with the viewer. Continuity oddity: at one point during the film, Picard looks at a photo of himself as a young man. 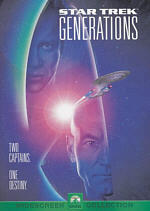 The 20-something Picard sports a noticeable lack of hair; if anything, he looks balder than the current incarnation. However, when we saw young Picard on the TV series, he had a normal shock of hair on his head. I fully understand the reasons they changed this for the movie – which I won’t discuss since they fall into the spoiler realm – but it still seems like a weird choice. 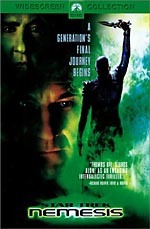 Star Trek: Nemesis appears in an aspect ratio of approximately 2.35:1 on this single-sided, double-layered DVD; the image has been enhanced for 16X9 televisions. Though a few small issues popped up at times, overall Nemesis presented a very solid picture. For the most part, sharpness appeared terrific. A few oddly soft sequences occurred. For example, the opening shots of the Romulan senate were moderately ill defined and indistinct. Similar issues popped up once or twice during the remainder of the film, but it usually looked concise and detailed. Jagged edges showed no concerns, but I witnessed a little shimmering at times and a sliver of edge enhancement in a couple of shots. Print flaws seemed limited to a speckle or two; otherwise, I discerned no defects. Nemesis usually presented a rather rich and sumptuous palette, but it occasionally went with extremely stylized tones. The most notable example of this occurred during the shots on desert planet Kolarus III. The film went for a heavily bleached appearance there that totally washed out any colors. Otherwise, the movie featured nicely vivid and vibrant hues that presented no problems. Black levels tended to appear deep and dense, and shadow detail normally came across as accurate and well defined. I thought the initial low-light shots on the Scimitar were a little murky, but that issue didn’t recur. Ultimately, Nemesis fell short of greatness visually but it mostly looked terrific. I found the Dolby Digital 5.1 soundtrack of Nemesis to seem even stronger than the image. As one might expect from this sort of action flick, the soundfield played a strong role in the proceedings. Much of the time, all five channels got a nice workout. The score demonstrated nice stereo imaging and effects received accurate and precise localization. Elements popped up where I expected them and they blended together smoothly. Quite a few scenes offered solid surround usage as well. The dune buggy chase on Kolarus III really kicked the track into gear, and the escape from the Scimitar and other ship battles also demonstrated fine movement and integration. Audio quality appeared very good. Effects came across as accurate and distinctive, and they failed to demonstrate any signs of distortion or other flaws. Speech sounded natural and warm, with no issues related to edginess or intelligibility. Music was bright and full, as the score seemed dynamic and rich. Bass response appeared tight and bold throughout the movie; some sequences really tested my subwoofer. The soundtrack of Nemesis didn’t match “demonstration” levels, but it offered the kind of vivid and involving auditory experience I expected. For the supplements on this DVD, we begin with an audio commentary from director Stuart Baird. He offers a running, screen-specific piece that only intermittently seems interesting. The director discusses changes in the script, scenes edited out of the movie, effects challenges, visual choices, and a few other elements. At best, he adds a smattering of worthwhile notes, such as when he relates the actual danger experienced by Jonathan Frakes during a stunt. However, Baird goes silent a lot of the time, and when he does speak, his statements remain fairly uncompelling. I didn’t mind the time I spent with Baird, but after he finished, I found it tough to recall any stimulating and concrete notes he’d provided. This remains a very mediocre track. Next we find a series of four short documentaries. We revisit the director with New Frontiers: Stuart Baird on Directing Nemesis. The eight-minute and 42-second featurette offers the standard mix of movie clips, behind the scenes footage, and interviews, a format it shares with the other three programs. It starts with some praise for the director from producer Rick Berman and actors Patrick Stewart, Jonathan Frakes, Brent Spiner, and Tom Hardy, but the meat of it presents comments from Baird himself. The director discusses how he latched onto the project, his prior ignorance of the Trek universe, the casting of Hardy, and some character introspection. His remarks here seem pretty compelling and useful, which offers a contrast to his fairly dull commentary. Unfortunately, the short program includes way too many movie clips. Message to the DVD’s producers: we already own the flick, so we don’t need to see all that stuff! It feels like it’s there just to pad the running time of the featurette, but it’s unnecessary and somewhat tedious. Otherwise, “Frontiers” offers a reasonable amount of decent material. After this we get A Bold Vision of the Final Frontier. The 10-minute and 16-second piece presents remarks from Baird as he covers a few subjects. He chats about the design of the Scimitar bridge, storyboards, shooting the action scenes, using gimbals for explosions, editing, and the creation of the movie’s climax. Baird nicely relates his thoughts about the various topics, and the presentation uses some split-screens so we get to see production shots compared with the final thing. It’s a good little program that neatly illustrates a few areas of the filmmaking process. While the first two documentaries concentrated on the director, we hear more about the cast during A Star Trek Family’s Final Journey. The 16-minute and 16-second piece includes remarks from writer John Logan, producer Berman, and actors Stewart, Spiner, Frakes, Marina Sirtis, LeVar Burton, Gates McFadden, Whoopi Goldberg, and Michael Dorn. Actually, while I thought “Journey” would mostly focus on the experience of the Next Generation gang’s last cinematic go-round, instead it largely concentrates on some character and story issues. It delves into the movie’s themes and related areas. It seems moderately insightful but not much more than that. The last documentary, Red Alert! Shooting the Action of Nemesis runs 10 minutes and eight seconds. It presents remarks form actors Frakes, Sirtis, Spiner, Dorn, Stewart, and Ron Perlman plus stunt coordinator Doug Coleman. They cover the shooting of the Argo sequence as well as the fight between Riker and the Viceroy and the visual effects for the late battle scene between two starships. Not a lot of depth appears here, but it gives us enough interesting comments and nice behind the scenes footage to moderately flesh out its subject. An intriguing addition comes next via seven Deleted Scenes. These run a total of 19 minutes and 53 seconds, though that running time includes some interview statements from director Baird, producer Berman, and actor Stewart. A few of the clips offer fairly substantial standalone sequences, while others feature smaller lifts from existing scenes. None really needed to be in the movie, and an alternate introduction to Shinzon was a good one to lose. A bit in which Worf expresses his disdain for Romulans probably should have stayed, however, as it pays off later in the film; without this context, Worf’s ultimate statement makes less sense. Another would have been nice to keep if just to give poor Gates McFadden some extra screen time; she always got the shaft more than any of the other actors. The alternate ending is interesting but ultimately not as effective as the one they used. Though we don’t get full explanations for all the cuts, the comments add some nice backstory to the removals. We get some information about the scenes and occasionally hear why they didn’t make the final film. Not all of the sequences come with remarks, however; actually, those statements precede only three of the seven clips. Finally, a Photo Gallery presents 40 stills. Mostly these offer concept art and design materials. Negative note: the DVD doesn’t include the film’s trailer. Positive note: all of the video extras feature English and French subtitles. In an unusual move, when the Nemesis DVD starts, it gives you an option: check out some previews or skip straight to the main menu. If you choose the former, you’ll see ads for Deep Space Nine (“Coming February 2003!”), the Las Vegas Hilton’s Star Trek: The Experience attraction, and The Hours. (What is this, one of those “Which one doesn’t fit?” games?) While it’s nice to get the option to jump straight to the main menu – which this will do if you don’t select anything – it’s too bad Paramount still saddles their DVDs with unskippable warnings and logos. It always takes longer than necessary to get to the main menu on their discs, and Nemesis is no exception. A fairly middle of the road Star Trek flick, Nemesis has its moments but doesn’t stand with the best of the series. Happily, it seems more interesting the second time around, so perhaps eventually it’ll occupy a higher status for me. Right now, however, it appears generally well made and entertaining, but it doesn’t quite move well enough to qualify as a true Trek winner. The DVD, on the other hand, seems quite strong. It presents very good picture and audio quality along with a fairly informative batch of supplements. Understandably, some fans may shy away from this version of Nemesis due to thoughts that we’ll eventually get a two-DVD edition of the film, but I think the current release seems complete enough to recommend it.